Teen stretch marks were not something I considered to be possible, like most I believed that they were reserved for older and most likely pregnant women? Then with a sudden growth spurt I noticed almost purple and angry looking marks on my hips last year. Oh hello stretch marks, nice of you to the party! Stretch marks are the result of the skin suddenly stretching often due to growth, weight gain or rather oddly weight loss. The middle layer of skin (dermis) fractures in places, as a result the red/purple lines on the skin are the deeper layers of the dermis shining through. Before you panic like I did, rest assure they are completely normal and in most instances unavoidable; as a matter of a fact some of us are more genetically prone to stretch marks than others. The lines that form due to stretch marks can form both vertically and horizontally and are some what common within all teenagers, yes even males too! Any age, any size and any skin tone can develop stretch marks and of course that includes celebrities. Recently model Christie Teigen (image above) shared her stretch marks on instagram - proving once and for all that even celebrities have normal and very human imperfections. So now we know how and to some extent they why but what can we do to reduce and prevent (to the best of our ability of course, sometime genetics are against us). The answer really is as simple: moisturising and exfoliation - keeping the skin supple and hydrated can allow the skin to expand without breaking to crudely put it. As oils tend to penetrate the dermis deeper than a standard body butter or lotion these are your best bet. In my household we swear by Bio Oil but there are many other more budget friendly products out there that do a similar job such as: Palmers Skin Therapy Oil and Superdrug Restore Skin Oil, or even Vitamin E Oil. As a matter of a fact Vitamin E oil can help to fade stretch marks a little quicker as can Rosehip Oil. In the same vain keeping hydrated inwardly is equally important, if possible do try and gulp, sip and swig the daily recommend water quota intake. Yes stretch marks can affect your confidence, the good news is that over time they will fade and can often be practically invisible. Like I have said above they are one hundred percent normal and I'm sure many people you know will have a few silver lines on their body too. If you do want to somewhat camouflage your stretch marks I have found a little self tanner to work wonders, or even body foundation such as Vichy Dermablend Body Foundation. For a more permanent fix you can exfoliate your body daily (or just the affected areas), to speed up the skin renewal process and of course to a degree resurface the area. Yes there are more medical approaches such as laser treatments and dermabrasion. As I have no knowledge of either I can not personal recommend them as an option, what I can say is that it a normal skin problem and you are not alone. If you have any tips or tricks, or perhaps advice in regards to stretch marks? 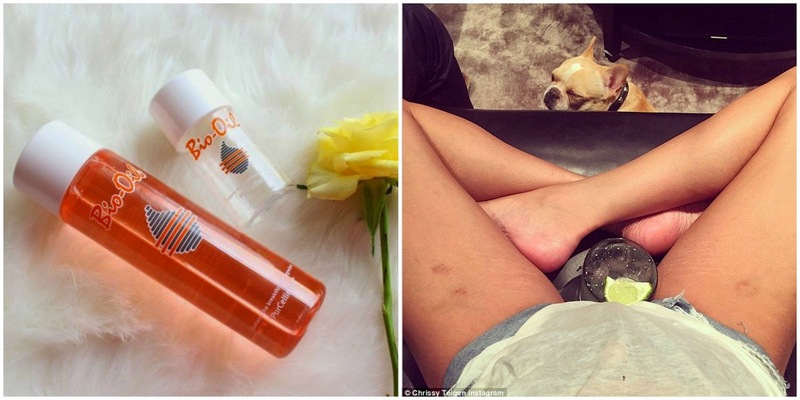 I've used Bio Oil in the past on my stretchmarks and it definitely helped to reduce them to almost invisible. I'm SO glad someone is talking about stretch marks being a thing that people get when they aren't pregnant/had significant weight gain, cause I used to be so paranoid. I struggle committing to bio-oil twice a day though, I feel like I'm torturing myself with greasy feeling clothes! Haha. Bio Oil is incredible, definitely recommend! Sorry to hear that - I hope one day soon there is a permanent cure that doesn't cost the earth! I have stretch marks near my bum (for no apparent reason) but I'll need to try Bio Oil for it! Oils can only do so much. It all depends on the elasticity of your skin....you could be slapping bio oil on all day and it still won't prevent them! Genetics and luck play a big part...some people find there more prone to them than others. I had some stretch marks on my tummy a few months ago, and I was on a bit of a budget so instead of buying bio oil, I bought Palmers skin therapy oil! It was amazing, the stretch marks completely disappeared (I think it was definitely good to tackle them straight away) I would definitely recommend it! Same in mine! We all seem to have Bio Oil.